GAMMA MON (Gamma Monocerotis). Or was it once "Alpha Monocerotis" as the Bright Star Catalogue claims. Probably not. Since Monoceros (the Unicorn, east of Orion) was invented in 1613, more than a decade after Bayer published his great work, he could not have assigned the Greek letter. That task was begun in the nineteenth century by Francis Baily (of solar eclipse Baily's Beads fame), who lettered only 26 Mon (a Flamsteed number) as Gamma, and finished by B. A. Gould (he of the Gould Belt of hot blue stars that tilts some from the Milky Way), who gave Gamma to Flamsteed 5, Alpha to 26 (replacing Baily's Gamma), and Beta to 11 (all as described by Wagman). Given that they are all about the same fourth magnitude brightness (Gamma at 3.98 actually ranking third), the confusion is no surprise. What is not confusing is that Gamma Mon is class K giant, though at K3 perhaps more colorful than most (Smythe and Chambers, writing from the nineteenth century, calling it "a fine orange star") and one certainly more luminous and massive than usual. 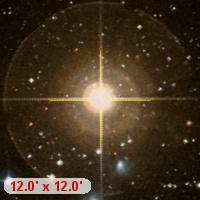 With a distance of 498 light years (give or take 14 or so) and a well-defined temperature of 4320 Kelvin (to account for a fair bit of infrared radiation), our "fine orange star" radiates with a luminosity of 945 Suns, from which (with temperature) we find a substantial radius of 55 times solar, or some two-thirds the size of Mercury's orbit. The rotation period seems to be unknown. The theory of stellar structure and evolution tells of a substantial mass of 4.5 to 5 times the mass of the Sun depending on the exact states of ageing and fusion of helium into carbon and oxygen. Beginning life as a mid class B (B5 to B6) hydrogen fusing dwarf more than 100 million years ago, it will (after sloughing off its outer envelope) die as a 0.85 or so solar mass white dwarf. But wait: there is more. Gamma Mon is listed as a mild barium star (one with an overabundance of barium and other heavier elements), which implies that it was contaminated with the by-products of nuclear fusion by a more massive companion that went through its evolution and is now a dim white dwarf. But there is no evidence for such a close orbiting neighbor, so the "barium star" tag is probably spurious. Two other "companions," however, are not. At a separation of 54 seconds of arc from the orange giant, a dim 13th magnitude star, Gamma Mon B, is moving too fast relative to Gamma A, and is certainly just a line of sight coincidence. Another nearby candidate, 14th magnitude Gamma C, 48 seconds of arc distant, is probably line of sight as well. If it is a real companion, it has the brightness of a K7 dwarf and lies at least 7300 Astronomical Units from our K3 giant, which would give it a period of at least 270,000 years. We won't know the dim bulb's status until we watch a lot longer to see if the two track each other against the background stars. Written by Jim Kaler 2/22/13. Return to STARS.